As the name suggests, the Ruddy Turnstone often forages by turning over stones and other objects. This is a highly migratory shorebird breeding in the high arctic of Eurasia and North America and wintering on coastlines almost worldwide. The bold patterning of this shorebird makes it one of the easiest to identify in all plumages. In Tennessee, the Ruddy Turnstone is a rare but regular migrant most likely to be found on open mud flats and sand bars in May, or from early August to mid-September statewide. Description: This small, stocky shorebird with short orange legs, and a short, wedge-shaped, black, slightly upturned bill, has a distinct plumage in all seasons. In breeding plumage (April-September), the back is a bright chestnut color, and the black-and-white face pattern is clown-like. The non-breeding plumage pattern (September-April) is similar but is duller brown on the back and face. Underparts are always white. In flight, it has a bold white-and-dark wing pattern, a white lower back, and the tail is white with a black terminal band. Juvenile birds (August-November) resemble winter adults, but are slightly more brownish overall with a paler head. Voice: Flight call is a relatively low, mellow, bouncing rattle. Also gives a single, sharp klew call. There are no shorebirds in the eastern United States that are easily confused with the Ruddy Turnstone. Habitat: During migration in Tennessee, they frequent open mud flats and sand bars. Diet: Aquatic invertebrates and insects, also occasionally carrion, garbage, and bird's eggs. 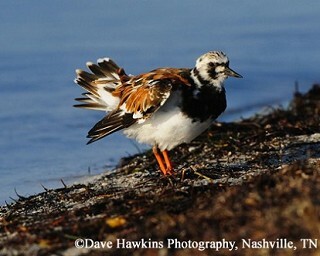 Nesting and reproduction: Ruddy Turnstones nest in the high arctic, and have never been documented nesting in Tennessee. Status in Tennessee: The Ruddy Turnstone is a rare but regular migrant statewide. In spring it is usually present only in May, but in fall can be found from early August through September and into early October. The global population appears to be relatively stable. As part of the courtship display, the male makes several nest-like scrapes within his territory, often close to the final site where the female makes her final nest-scrape. Carolus Linnaeus, Swedish botanist, physician and zoologist, first described the Ruddy Turnstone in 1758. An opportunistic feeder, the Ruddy Turnstone feeds on rocky and sandy beaches during winter and on migration, by turning over rocks, pebbles, seaweeds, shells, and other items with its stout, strong, and slightly upturned upper mandible, also used to probe, jab, and dig for food in winter and summer. Like many shorebirds, both parents incubate the eggs; the female leaves for migration before the young birds fledge; the males migrate leaving the young birds to fend for themselves and migrate on their own in a few weeks later. Best places to see in Tennessee: Traditional shorebird locations such as Ensley bottoms and Rankin WMA. Nettleship, D. N. 2000. Ruddy Turnstone (Arenaria interpres), The Birds of North America Online (A. Poole, Ed.). Ithaca: Cornell Lab of Ornithology.